"What kind of cake do you want for your birthday? ", said me. 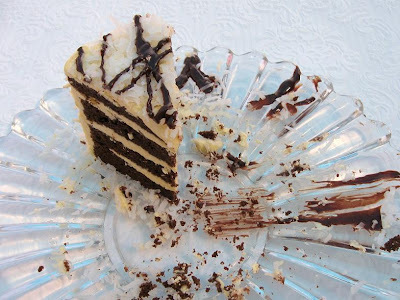 "I waaaannnt..........a chocolate cake, with vanilla buttercream, coconut all over and chocolate ganache drizzled on top. ", said pending 12 year old Nicholas. Wow. I didn't see that one coming. Should have...since my ten year old asked for a coconut cake with strawberry filling and plain buttercream. The above picture....the last slice...always in the possession of the birthday child. It was one delicious cake! Have I mentioned I love baking cakes?